General Rubber's Styles 1093, 1094 and 1095 PTFE single layer flanged ducting expansion joints are designed with lower spring rates for reduced reaction forces and greater movement capabilities within a compact body. This lightweight construction is optimally designed with external or internal laminated flanges and represents the most cost-effective arrangement for low pressure flanged ducting applications. The construction includes a PTFE fluoropolymer laminated flexible element and steel retaining rings. Additionally, they are designed to absorb large all-directional movements, reduce noise and vibration, compensate for misalignments, provide access to ducting and equipment and relieve duct and anchor stresses. General Rubber's Style 1093 offers up to 600°F with ± 3 PSI continuous service and zero porosity in wet and dry systems. The flexible element is constructed with PTFE fluoropolymer coated high tensile fiberglass reinforcement and a 9 Mil thick laminated PTFE fluoropolymer corrosion barrier. General Rubber's Style 1094 offers up to 1,000°F and ± 3 PSI continuous service. The flexible element is constructed with PTFE fluoropolymer coated high tensile fiberglass reinforcement, laminated PTFE fluoropolymer corrosion barrier and a laminated woven or needle mat fiberglass insulation layer. General Rubber's Style 1095 offers up to 500°F with ± 3 PSI continuous service, zero porosity in wet and dry systems and a cycle life in the millions. 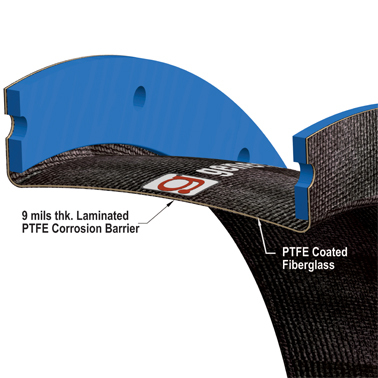 The flexible element is constructed of a solid 30 Mil thick PTFE fluoropolymer layer and is available in thicknesses up to 60 Mil; offering the ultimate chemical resistance with no fiberglass component to fatigue.